Hyde Park, located just 13 miles west of Orlando, Florida, is an active adult community designed for retirees 55 and over who wish to pursue the Affordable Florida Lifestyle. Our beautifully manicured gated property features affordably priced manufactured homes, a spacious community clubhouse with pool, and an onsite management team that is committed to making being a resident of Hyde Park as enjoyable and comfortable as possible. The focus of daily life at Hyde Park is our modern clubhouse where residents are able to engage in a variety of interesting activities. In addition to having a large heated pool, the Hyde Park clubhouse features a hot tub, banquet hall with stage and dance floor, fitness center, library/cards room, billiards room, full kitchen, bingo hall, shuffleboard courts, garden sitting area, picnic area, and more. With so many onsite amenities and offsite attractions, Hyde Park near Orlando is highly deserving of the active adult community label. Though peaceful and laid back, Hyde Park is a place where it’s easy to stay active and have fun during retirement. 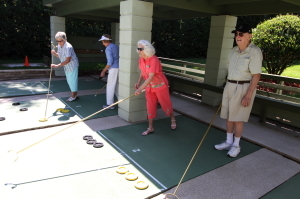 From taking a dip in our large heated pool and playing shuffleboard to socializing with your neighbors and embarking on an exciting day trip to Orlando, you’ll never be without something great to do as a resident of our active adult community. Contact Hyde Park today to request more information about our community and/or schedule a visit.